Detectives continue to investigate the death of a 38-year-old Puna man who was killed in an early morning shooting in Puna, yesterday, Monday, (March 18). The medical examiner performed an autopsy on the body of Joshua John Santos and determined the cause of death as gunshot wounds to the chest and ruled the death as a homicide. Police have issued an islandwide all points bulletin and are asking for the public’s assistance in identifying the whereabouts of 35-year-old Ryan Frederick Davis of Puna. Davis is described as a local male, 5-feet-7-inches, weighing about 230 pounds., heavy build, tan complexion, unshaven, neck-length curly black hair, and with brown eyes. Davis has multiple tattoos along both arms. 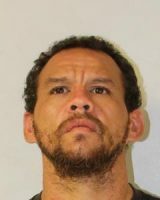 Police caution the public from approaching Davis, as he is considered armed and dangerous and instead are asked to call police at (808) 935-3311 to report his location.